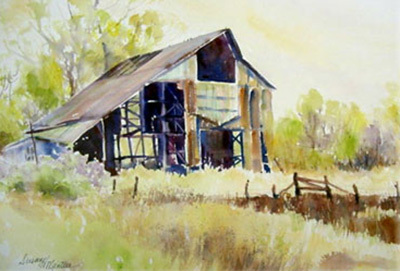 Watercolor painter, Susan Minteer receives much of her inspiration from everyday life experiences in her rural surroundings. She attempts to ‘ preserve’ the changing countryside with paper, water, and colorful pigments. Splashy florals and representational landscape paintings are her favorites. Minteer also enjoys making trips last longer by painting from photographs taken while traveling. Inspirational pieces give her opportunities to share her love for the Lord. After graduating from Baker University with a Bachelor of Arts degree in Psychology and Sociology, Minteer resumed an informal art education. Participation in many workshops with local and nationally known instructors such as Eric Weigardt, Tom Francesconi, Steven Quiller, Jim Kosvanec, Ken Hosmer, Jim Hamil, Barbara Nechis, and Hugh Walkenshaw, gives Minteer a creative recharge which she passes along to her students. She enjoys sharing watercolor techniques and her enthusiasm for painting. 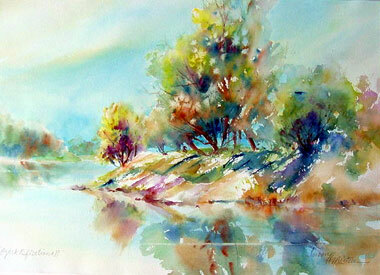 Artist’s Statement: My watercolor paintings are an expression of gratitude to The Father for the blessings in my life. I enjoy country living and its continual supply of inspiration for landscapes. 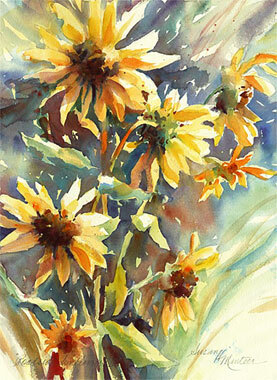 A lifetime of gardening gives color, shape and pattern to my floral paintings. Gardens and the countryside are in my roots and in my genes, a heritage shared with many of my viewers and collectors. The intent is to express my visual ideas with emotion, vibrant color, and lively design. I find joy in sharing both the creative process and the resulting artwork with others. I believe that because “we are His workmanship”, creativity is a part of our being. I am grateful for the opportunities I have to share these gifts.